Our worship services are focused on Christ and His grace and mercy for us. 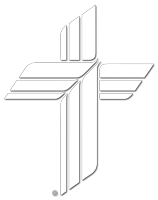 We use a variety of liturgies, Scripture readings that follow the church year, hymns and songs which relate to the theme of the day or the season, and a message that is usually based on one of the Scripture readings. On the second, fourth, and fifth Sundays there is also a children's message. And from time-to-time you can also expect a surprise. 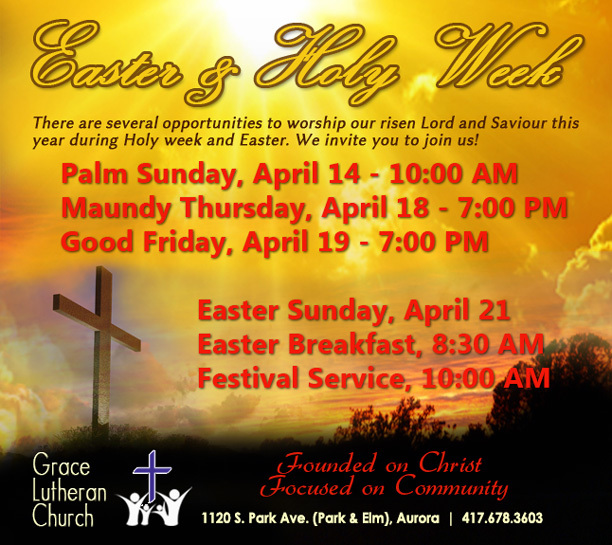 We welcome you and encourage you to bring a friend. 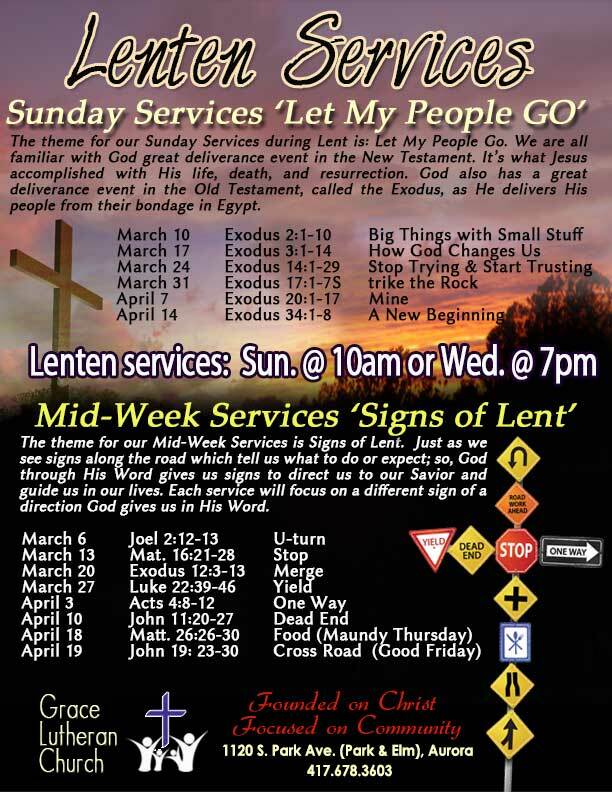 March 6 - April 10: The theme for our Mid-Week Services is Signs of Lent. Just as we see signs along the road which tell us what to do or expect; so, God through His Word gives us signs to direct us to our Savior and guide us in our lives. Each service will focus on a different sign of a direction God gives us in His Word. 9:00 AM - Adult Happy Half Hour. Thirty minutes for adult biblical instruction. Currently we are using video based studies to grow in our understanding of issues that followers of Christ face in their daily lives. When we complete one series we choose another. Started a new video series "Stuff They Didn't Teach Me in Sunday School" about Genesis. We have all heard the Genesis stories before, but this series can help us gain a deeper insight and appreciation for these familiar stories, and may even help us see some of them in a brand new way. Please join us for this new series. 9:00 AM - Youth Sunday School. Thirty minute lessons for youth age Pre-K through 8th grade. 9:30 AM - Fellowship Time. A wonderful time of fellowship between adults and youth as we enjoy treats, coffee, and refreshments. 10:00 AM - Worship Service. Time to partake in the worship of our God. Holy Communion - 1st and 3rd Sunday's. Holy Communion is celebrated on the first and third Sunday of the month. We believe and teach that the body and blood of Jesus Christ are truly present in and with the bread and the wine in the sacrament of Holy Communion. It is our belief that this sacrament is received by the penitent believing Christians assuring them of the forgiveness of sins of their sins and strengthening their faith. Scripture readings are listed below. You can click on the speaker icon to listen to the readings. Oral reading consist of entire chapter, not specific verses. Or you may read or print all of the weekly readings by clicking on the book icon at the end. Can't make it one Sunday? Want to go back and hear the sermon again? Want to share the sermon with a friend? Each week we post the sermons for you to be able to listen to at your convenience. Highlight the desired selection and press the play button at the top of the player. Make sure your sound is up on your computer. Enjoy them over and over again or share with a friend! They are also posted on our Facebook page.